Lucy arrives home with Emma's mice; Victoria and Albert. Scott is looking at honeymoon brochures and says he will be making the most of it, as it's the last holiday he will be having for a very long time. Helen gives him a letter – it's from the insurance company. The cheque for his stolen car amounts to a small amount. Helen tells him he is still entitled to some benefits and tells him he and Charlene will have to put aside their dreams until they have some money behind them. Mike tells Daphne to go home, she tells him not to mention anything to Des about how stressed she has been today. Mrs Mangel is telling Madge how good her day at work was. She is on her way to the supermarket to get something special for Harold's dinner. Madge tells her to stick to a nice, plain meal like meat pie with vegetables, or a nice rump steak. Mrs Mangel thanks her and hurries off. Jane and Harold arrive home and Mrs Mangel tells them to get ready for dinner. Harold starts fantasising about all the wonderful vegetarian dishes Mrs Mangel used to cook for him. Jane asks him to be careful what he says to Mrs Mangel about Len. Harold agrees but says it's against all of his principles. Madge comes off the phone to Shane. Max has broken his ankle and Shane has gone to help him out. Madge hopes he will be back in time for the wedding. Madge dishes up some steak and Henry asks what the special occasion is – Madge says it's just to welcome home an old friend. Harold runs out of the kitchen and into the bathroom. Mrs Mangel goes to call for the doctor but Jane assures her it's just because he is a vegetarian. 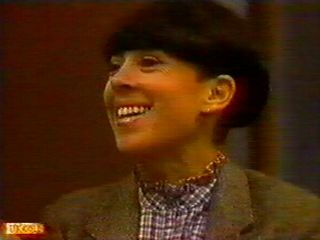 Mrs Mangel is upset she hasn't made a good impression and tells Jane she is considering Harold as a romantic prospect. She goes off to cook something more appropriate whilst Harold remerges from the bathroom appalled at his behaviour. Daphne and Mike are eating dinner, but Daphne is just fiddling with her food. Des is working late and Daphne feels like everything is going wrong. She tells Mike this should be the happiest time of their lives and all they can do is worry that they may lose their house. She says she's never wished anyone any pain but she wishes Mrs Mangel would curl up and die. Scott is still talking about the honeymoon and thinks he may holiday in Australia. Helen asks Lucy to tidy her room, as Julie and Hilary will soon be arriving. Lucy says Michael and Debbie don't mind mess but Helen insists. Helen and Jim talk about Hilary and are not exactly looking forward to her arrival. Mike arrives to see Jane and gets grief from Mrs Mangel at the doorstep. He offers Mrs Mangel an out of court settlement, as he feels responsible for what happened. He offers Mrs Mangel $7,000 to drop the whole thing. Mrs Mangel refuses his offer and shuts the door on him. 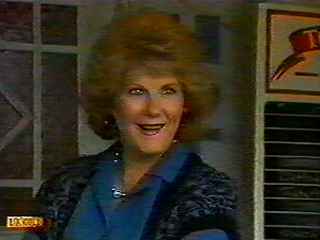 Jane tells Mrs Mangel that's all the money Mike has and he cares enough about Daphne to offer it to her. Mrs Mangel says nothing bad will happen to Daphne's baby and thinks Mike is exaggerating about how stressed Daphne is. Jane is angry and asks Mrs Mangel where her Christian passion is now. The Robinsons are hard at work clearing out the rooms for Julie and Hilary's impending arrival. Scott and Lucy are talking about Hilary's fussy ways when Helen calls Lucy into the kitchen. The mice cage is open and Victoria and Albert are gone. Mrs Mangel talks to Harold about her accident. Harold tells her he already knows about the lawsuit with the Clarkes. Mrs Mangel asks him if she is being uncharitable. Harold thinks she deserves some compensation but wishes it wasn't Des and Daphne who were on the other side. Lucy is still looking for the mice and Jim wants to set some traps but Lucy won't allow it. Whilst the place is in turmoil the doorbell rings – it's Hilary two days early! She immediately comments on the mess and says she is glad she was invited to this wedding seeing as she wasn't invited to Paul and Gails. Hilary starts to give out orders as Helen looks on in despair!